Background & Objective: Pleural fluid culture is the standard of diagnosis for infectious etiology in parapneumonic effusion and empyema. However, the sensitivity is poor in tertiary centers due to prior antibiotic therapy. Newer nonculture-based molecular diagnostics are emerging as effective alternatives for microbial diagnosis. This prospective study evaluates the efficacy of Syndrome Evaluation System (SES), a multiplex molecular diagnostic test, in establishing the microbial etiology of empyema and clinical correlations of SES results with severity, interventions, and outcomes. Materials and Methods: Pleural fluid samples from 31 adult patients clinically diagnosed with empyema/complicated parapneumonic effusion were subjected to routine culture and SES. Routine laboratory tests, imaging, and antibiotic therapy were instituted as per standard care. Results: SES had 2.6-fold higher detection rate as compared to pleural fluid culture. 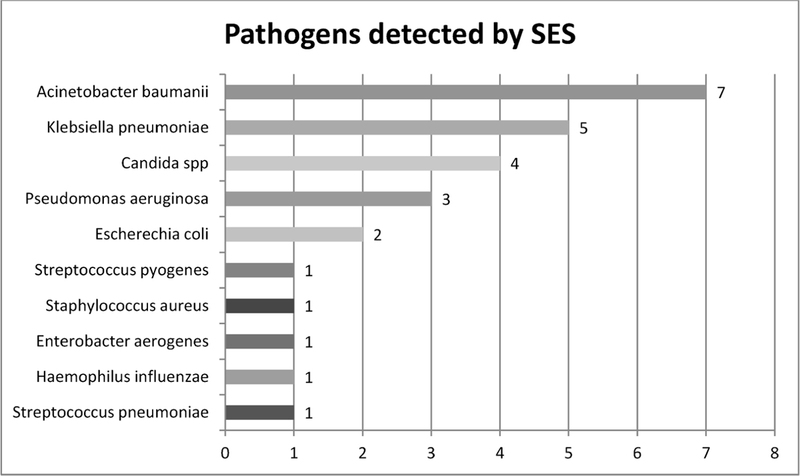 A total of 16 samples (52%) were positive for pathogens on SES, whereas only six samples (20%) were positive on culture. SES was 83.33% concordant with culture. SES results were available within 24 h as compared to >72 h for culture. Prevalence of Gram-negative bacteria was 73.1%. SES positives were significantly associated with severity of disease and need to conduct more invasive procedures like thoracotomy and decortication. SES negatives had superior clinical outcomes compared to SES positives. Conclusion: SES has higher yield in microbial diagnosis compared to standard culture. It is sensitive, specific, and provides valuable information regarding a number of clinical correlates associated with empyema and complicated parapneumonic effusion. SES opens up new possibilities in understanding pathogenesis, management, and outcome in empyema. Empyema is most commonly caused by pneumonia. Approximately 20% of patients with community-acquired pneumonia develop pleural effusions. In about 30% of these patients, the condition progresses to empyema. Unresolved parapneumonic effusions, lung abscess, and bronchiectasis may get infected and develop into empyema. Pathogens responsible for pleural infection differ from those causing pneumonia. Increasing global incidence of empyema, especially in children, is a serious concern. Microbial etiology of empyema has changed significantly with the widespread use of antibiotics. Gram-negative organisms are being encountered more frequently, which is in contrast to what was once a predominantly Gram-positive infection. Increasing incidence of multidrug-resistant organisms (MDR)-associated nosocomial infection is also reflected in the pleural infection, particularly in developing countries. Diagnosis of the etiological agent is key for effective management in empyema. Pleural fluid culture is the gold standard. Globally, pleural fluid culture positivity rates are less than 20%. This low rate of pathogen detection not only results in failure to use the right antibiotic but also makes it difficult to understand the pathophysiology of these organisms. Syndrome Evaluation System (SES) is a commercially available multiplex PCR system proven to have four times higher detection rate, reduce mortality in neonatal sepsis by five folds as well as significantly reduce antibiotic usage and hospital stay, resulting in significant cost reduction for patients. SES is validated by external quality assessment Quality Control for Molecular Diagnostics (QCMD) with 100% sensitivity and specificity. SES has been shown to increase the diagnostic yield, reduce the time to targeted antibiotic therapy, aid in de-escalation of high-ended antimicrobial, and save costs for adult patients with pneumonia. It has also been used to study the etiology of community-acquired pneumonia among children in India. In Central Nervous System (CNS) infections, SES has been shown to have far superior diagnostic yield compared to conventional tests, leading to antiviral de-escalations and therefore cost reduction. In this single-center prospective observational study, we evaluated the efficacy of SES in the etiological diagnosis of empyema in comparison to automated culture system. Our aim was to increase the sensitivity and help in the early detection of empyema by SES. We also wanted to understand the impact of this diagnostic tool on therapeutic decisions by clinicians and possibly on patient outcomes. To the best of our knowledge, this is the first study involving multiplex PCR technology for empyema in India. This study was conducted in our tertiary-level medical intensive care unit and pulmonary ward during the period from May 2013 to April 2014. Necessary Institutional Review Board approvals were taken before conducting the study. XCyton Diagnostics bore the cost of SES tests for all patients in the study. Ultrasound or other radiological diagnostic imaging evidence of empyema. Frank pus or turbid pleural fluid with pH <7.2, glucose <60 mg/dl, and LDH >3 times upper normal limit for serum. Empyema secondary to penetrating or blunt trauma chest. Empyema secondary to any surgical procedure. Patients who had already undergone thoracentesis at the referring hospital. Pleural fluid samples of 31 adult patients, clinically diagnosed with empyema based on clinical evidence of pneumonia with effusion or pleural aspirate containing pus, were subjected to routine biochemistry, cell counts, Gram staining, and culture (BD BACTEC™, Becton, Dickinson and Company, New Jersey, United States) in our laboratory. All necessary sterile and aseptic precautions were taken to collect pleural fluid during the initial diagnostic aspiration with a clean needle stick. A volume of 10 ml each of pleural fluid samples were collected in BACTEC culture bottles. A volume of 2 ml of pleural fluid was collected at the same time in ethylenediaminetetraacetic acid (EDTA) vacutainer and analyzed on SES at XCyton Diagnostics, Bengaluru, India, as per the methodology described by Bhat et al. SES is essentially a three-step process. It involves nucleic acid extraction from a clinical sample and complementary deoxyribonucleic acid (cDNA) preparation if applicable, multiplex nucleic acid amplification in a single reaction mix using primers designed specifically for virulence specific genes of pathogens, and hybridization of amplicons in a DNA macrochip using nucleic acid probes. These primers and probes are patented by XCyton Diagnostics. Sepsis panel of SES was used for this study [Table 1]. Diagnostic imaging like chest X-ray, chest ultrasound, and Computed Tomography (CT) of thorax was performed as deemed clinically appropriate. Standard therapy was provided to all patients on empiric basis initially and appropriately changed, based on diagnostic information from our laboratory and XCyton Diagnostics. Descriptive statistics was used to analyze qualitative and discrete variables. Two-tailed Z test was conducted to test significance between two variables. We considered P value of less than 0.05 as statistically significant correlation between two variables. A total of 31 consecutive patients (22 males and nine females), with a mean age of 48.06 years, were included in this study. The average duration of illness was 24.61 (±23.18) days. Chest X-ray was performed for all 31 patients. Depending on the findings of chest X-ray, subsequent chest ultrasound and CT of thorax were performed on patients as required. Generally, if chest X-ray showed only uncomplicated effusions, further imaging was not performed. However, if chest X-ray was suggestive of complications like hydropneumothorax, pyopneumothorax, loculations, etc., chest ultrasound and CT of thorax were performed. Radiological evidence from all these three procedures revealed that 22 patients had complications including loculations and septations along with effusions. SES was positive in 15 (68.2%) of these cases. Nine patients did not have any complications. SES was positive in one of these cases (11.1%). This difference is statistically significant as tested on two-tailed Z test (P = 0.00782). [Figure 1] provides the details. Pleural fluid cultures were performed for 30 patients. One patient was treated with antibiotics for left-sided empyema 2 weeks prior to the current hospitalization. Hence, no culture was performed for this patient. Out of the 30 samples sent for culture, six were positive. One clinical sample among these six was polymicrobial infection (16%), wherein Acinetobacter baumannii and unspeciated Streptococcus were found to be positive. Two clinical samples grew unspeciated Streptococcus, one Staphylococcus aureas, one unspeciated Pseudomonas, whereas the remaining sample was positive for Serratia marcescens. The yield of pleural fluid culture was thus 20%. Out of the five different pathogens detected by pleural fluid culture, three (60%) were Gram-negative bacteria (GNB), whereas the remaining two (40%) were Gram-positive bacteria (GPB). In terms of rank order, Streptococcus was found to be positive in three patients, as the only organism in two patients and along with Acinetobacter in another patient. SES detected pathogens in 16 out of 31 pleural fluid samples, yielding a clinical sensitivity or detection rate of 52%. This is 2.6-fold higher as compared to pleural fluid culture. The difference in detection rates by SES and culture is statistically significant as tested on two-tailed Z test (P = 0.01). A. baumannii was found to be the most common pathogen. [Figure 2] provides details of the rank order of pathogens detected by SES. A total of 10 unique pathogen species were detected by SES: six were GNB, three were GPB, and one was a fungus. Hence, in terms of unique pathogen species being identified, 60% of them were GNB in SES. Out of the 16 positives detected by SES, eight were polymicrobial (50%). 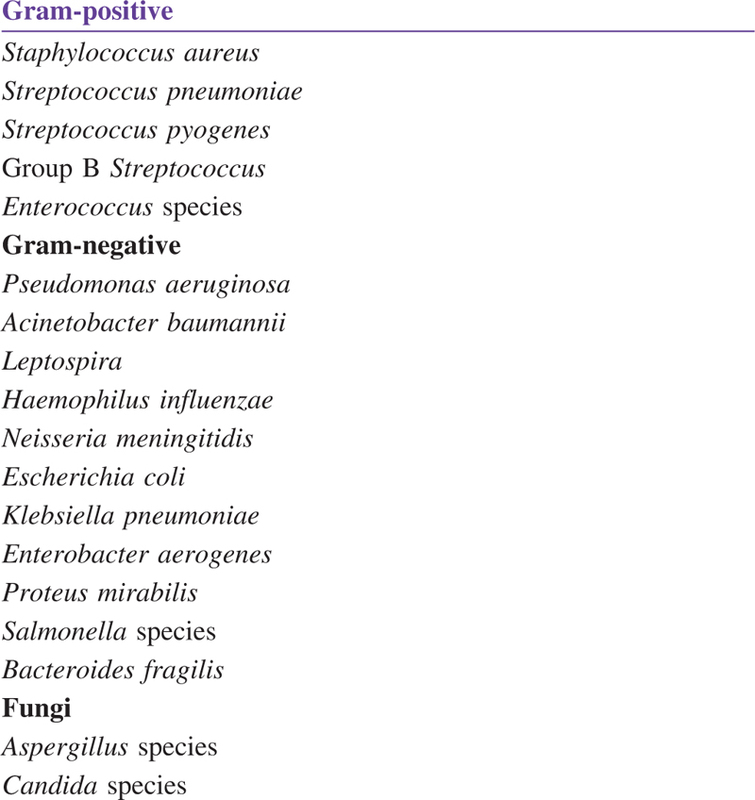 These 16 positive cases detected by SES accounted for a count of 26 pathogens (10 unique pathogens). Overlaps in pathogens are due to detection of same pathogens in multiple patients, either as a part of mono or polymicrobial infections. Among these 26 pathogens detected (in 16 patients), 19 were GNB (73.1%), three were GPB (11.5%), and four were fungus (15.4%). [Table 2] provides the details of patient-wise detection of pathogens by SES. [Table 3] provides the details of concordance between the pathogens detected by pleural fluid culture and SES. SES was 83.33% concordant with pleural fluid culture. In one sample, SES detected A. baumannii, whereas culture grew unspeciated Streptococcus. In another sample, SES was negative for Acinetobacter, whereas culture was positive. S. marcescens was grown by culture in one sample, which is not a part of the panel used in SES. In four out these six cases with positive pleural cultures, SES detected additional pathogens other than what culture had grown. In the sample where SES detected Streptococcus pneumoniae and Pseudomonas aeruginosa (pleural fluid culture grew A. baumannii and Streptococcus spp. ), Pseudomonas was also found to be positive in both sputum and bronchoalveolar lavage (BAL) cultures in this patient. Similarly, in the sample where SES detected Klebsiella pneumoniae, P. aeruginosa, and A. baumannii (pleural fluid culture was positive for Pseudomonas spp. ), A. baumannii was positive in BAL culture. SES report was available to us within 24 h of sending the sample to XCyton Diagnostics. Pleural fluid culture report with sensitivity was available only by the 3rd day. Therapeutic interventions on these 31 patients were based on clinical, radiological, biochemical, and microbiological information. Decision to change initial empirical antibiotics was based on pleural fluid culture, SES, and clinical judgment. In terms of treatment modality, intercostals drainage (ICD) with chest tube insertion was performed on 23 patients (74.2%). Five patients needed decortication for trapped lung. In the SES positive subpopulation of 16 patients, ICD had to be conducted on 15 patients (93.7%) and thoracentesis on only one patient. In the SES-negative subpopulation of 15 patients, ICD had to be performed on eight patients (53.3%). This difference in treatment modality vis-à-vis SES results is statistically significant as tested on two-tailed Z test (P = 0.01016). Out of the 31 patients, 15 patients improved clinically (48.4%), three patients died (9.7%), and five patients had to be decorticated (16.1%). One patient developed right effusion. This patient was initially diagnosed with left moderate effusion with thin floating septations and underlying lung collapse. All cultures were negative. SES detected A. baumannii. The patient was treated with Imipenem. One patient was placed on antituberculosis treatment based on clinical suspicion, in addition to pharmacological treatment for empyema. One patient was discharged against medical advice, and outcome data on the remaining five patients are not available. The SES-negative subpopulation had a better outcome with nine out of 15 patients (60%) clinically improving as compared to six out of 16 patients (37.5%) in the SES-positive subpopulation (P = 0.22). There were no deaths in the SES-negative subpopulation as compared to three deaths in the SES-positive subpopulation. Details of patient outcome with respect to SES results are provided in [Figure 3]. Three patients died of septic shock and multiorgan failure. In one of the patients who died due to septic shock, blood culture was positive for MDR Acinetobacter and SES detected A. baumannii, Escherichia More Details coli, and K. pneumoniae in pleural fluid. Remaining two patients were negative on blood culture. SES was positive in pleural fluid for all the three patients, whereas pleural fluid culture was positive in one patient and negative for the remaining two patients. Therefore, out of the three deaths, the pleural fluid cultures grew bacteria in only one patient, whereas SES was positive in all these patients. Early and accurate diagnosis of causative pathogens remains integral to management and outcome in empyema. Cultures are often negative due to prior exposure to antibiotics, particularly in tertiary center such as ours. Jain et al. and Mohanty et al. reported pleural fluid culture yield to be 17.7% and 15.8%, respectively. Molecular diagnostics such as PCR have proved to be highly sensitive and beneficial in diagnosis of critical infections such as parapneumonic pleural effusion and empyema., SES is a multiplex molecular (PCR-based) diagnostic system developed by XCyton Diagnostics. In our study, the detection rate of organisms in SES was 52% as compared to 20% in conventional culture. Moreover, SES results were available to us within 24 h as compared to 3 days in case of culture. Early diagnosis and institution of appropriate antibiotics is likely to prevent the development of empyema and avoid multiple tests and unnecessary trial and error with antimicrobials, thereby saving substantial costs for patients. Once empyema is set, it is imperative to diagnose the causative pathogen and administer targeted therapy in addition to chest tube drainage. Our patients are already exposed to antibiotics prior to admission. In this study, we found a high concordance (83.3%) between SES and pleural fluid culture results. In one sample, SES detected A. baumannii, whereas culture was positive for unspeciated Streptococcus. The unspeciated Streptococcus in culture could probably be a skin contaminant. Skin commensals are not detected by SES, because its technology amplifies virulence-specific genes of pathogens only. However, the clinical sample where Acinetobacter was grown in culture but was negative on SES could be a false negative in SES. This could probably be due to low bacterial load below the limit of detection in SES. Importantly, in four out of six culture positives, SES detected additional organisms which raise an interesting point with regard to the etiology of empyema. It is possible that empyema could be polymicrobial to start with. After the entry of organisms in to the pleural fluid, only the most aggressive organism predominates. In the study by Luh et al., polymicrobial organisms, especially anaerobes, were found in 63% of patients with Streptococcus viridans empyemas and lung abscesses. The following observations were made with regard to SES results. No deaths were reported in the SES-negative subpopulation of 15 patients. Although not statistically significant, a substantially higher proportion of patients (60%) clinically improved in the SES-negative subpopulation as compared to the SES-positive subpopulation (37.5%). This fact is strengthened by our data on the correlation of the severity of illness as exhibited by imaging and SES results, as well as by the correlation of treatment modality used to treat empyema in the SES positive and negative subgroups. 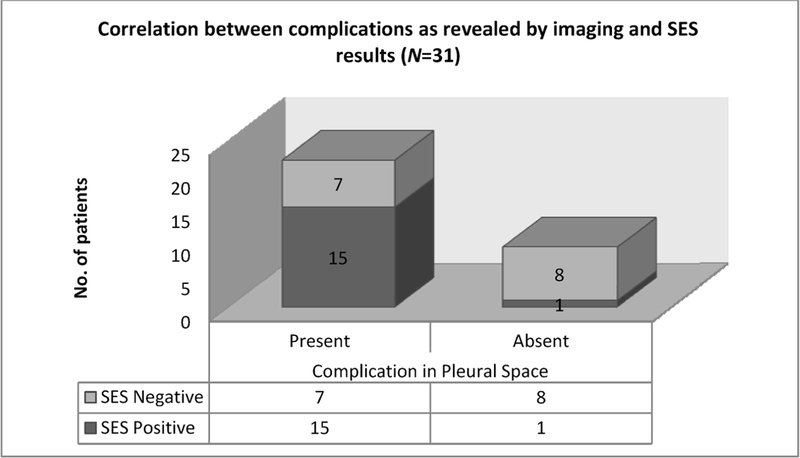 A significantly higher number of patients were positive for SES (15 out of 22, 68.2%) in those patients where imaging showed clinical evidence of complication, compared to those patients were imaging showed evidence of only effusions (one out of nine, 11.1%). Similarly, a significantly higher number of patients (15 out of 16, 93.7%) had to undergo intercostal chest drainage in the SES-positive subpopulation, as compared to the SES-negative subpopulation (eight out of 15, 53.3%). These differences are statistically significant. In our study, out of six cases needing thoracocentesis alone, five were SES negative. It is possible that detection of bacteria by SES might reflect a relatively higher or perhaps persistent microbiological load in the pleural cavity compared with SES-negative patients. In fact, SES negative results have been shown to be associated with zero mortality and readmissions in neonatal sepsis. SES negatives were also associated with de-escalation of antivirals in suspected CNS infections.,Complicated exudative parapneumonic effusions and empyemas should be drained to prevent further complications. However, when the degree of infection is less, or an infection is under control due to successful management with antibiotics, and hence the pleural fluid accumulation is less, minimally invasive interventional procedures may be more efficacious. Hence, when SES is negative, apart from appropriate de-escalation of antibiotics, choosing a lesser invasive intervention such as thoracocentesis may suffice in ensuring optimal outcome. This might also prevent more invasive procedures on these patients and thereby reduce hospital stay. We think that SES performed early will save costs on multiple tests, trials with antimicrobials, interventions, and readmissions. This will save patients costs estimated to be at least four to five times the cost incurred on performing the test itself, which remains a fraction of a day’s cost in Intensive Care Unit (ICU). This is particularly of importance where globally, routine microbial investigation of pleural fluid adds very little to the standard management of parapneumonic effusions. To the best of our knowledge, ours is the first study in India involving multiplex PCR-based diagnostics to study infectious etiology in empyema and pleural effusions in adults. In our study, Gram-negatives are predominant in the etiology of empyema and parapneumonic effusion. The role of SES in the detection of the bacterial etiology is more significant in the management of patient with parapneumonic effusion. SES provides a faster microbiological diagnosis and has significantly higher detection rate in identifying microbial etiology in parapneumonic effusion and empyema as compared to standard culture. Traditionally, pleural fluid aspiration, drainage, and decortication have been used in management of empyema. By SES, we have not changed the course of the disease but only facilitated in faster diagnosis, enabling us to intervene, change the management accordingly, and save cost for patients. However, our study has a limitation of sample size. A larger, controlled, multicenter study would help to confirm our findings and correlate the outcomes with the etiological agents in the causation of empyema. We thank Mr. Bharath N. from XCyton Diagnostics Pvt. Ltd for his help in database management and analytics. DC, Head, Clinical Research, is affiliated to XCyton Diagnostics Pvt. Ltd. where SES testing has been performed. Hence, there may be a potential conflict of interest. Porcel JM. Pleural fluid tests to identify complicated parapneumonic effusions. Curr Opin Pulm Med 2010;16:357-61. Yu H. Management of pleural effusion, empyema, and lung abscess. Semin Intervent Radiol 2011;28:75-86. Psallidas I, Corcoran JP, Rahman NM. Management of parapneumonic effusions and empyema. Semin Respir Crit Care Med 2014;35:715-22. Grijalva CG, Nuorti JP, Zhu Y, Griffin MR. Increasing incidence of empyema complicating childhood community-acquired pneumonia in the United States. Clin Infect Dis 2010;50:805-13. Porcel J, Vázquez P, Vives M, Nogués A, Falguera M, Manonelles A. Pleural space infections: Microbiologic and fluid characteristics in 84 patients. Internet J Pulm Med 2002;3:1. Chen KY, Hsueh PR, Liaw YS, Yang PC, Luh KT. A 10-year experience with bacteriology of acute thoracic empyema: Emphasis on Klebsiella pneumonia in patients with diabetes mellitus. Chest 2000;117:1685-9. Alfageme I, Muñoz F, Peña N, Umbría S. Empyema of the thorax in adults. Etiology, microbiologic findings, and management. Chest 1993;103:839-43. Vuori-Holopainen E, Salo E, Saxén H, Hedman K, Hyypiä T, Lahdenperä R et al. Etiological diagnosis of childhood pneumonia by use of transthoracic needle aspiration and modern microbiological methods. Clin Infect Dis 2002;34:583-90. Sakran W, Ababseh Zel D, Miron D, Koren A. Thoracic empyema in children: Clinical presentation, microbiology analysis and therapeutic options. J Infect Chemother 2014;20:262-5. Pernica JM, Moldovan I, Chan F, Slinger R. Real-time polymerase chain reaction for microbiological diagnosis of parapneumonic effusions in Canadian children. Can J Infect Dis Med Microbiol 2014;25:151-4. Saglani S, Harris KA, Wallis C, Hartley JC. Empyema: The use of broad range 16S rDNA PCR for pathogen detection. Arch Dis Child 2005;90:70-3. Le Monnier A, Carbonnelle E, Zahar JR, Le Bourgeois M, Abachin E, Quesne G et al. Microbiological diagnosis of empyema in children: Comparative evaluations by culture, polymerase chain reaction, and pneumococcal antigen detection in pleural fluids. Clin Infect Dis 2006;42:1135-40. Krenke K, Sadowy E, Podsiadły E, Hryniewicz W, Demkow U, Kulus M. Etiology of parapneumonic effusion and pleural empyema in children. The role of conventional and molecular microbiological tests. Respir Med 2016;116:28-33. Wu Y-D., Li W, Wei Y, Gao H-H, Shang S-Q, Du L-Z. Rapid and sensitive identification of bacterial infection and bacteria gram types in pleural fluid of children. Glob Pediatr Health 2015;2:2333794×15569302. Bhat BV, Prasad P, Ravi Kumar VB, Harish BN, Krishnakumari K, Rekha A et al. Syndrome evaluation system (SES) versus blood culture (BACTEC) in the diagnosis and management of neonatal sepsis—A randomized controlled trial. Indian J Pediatr 2016;83:370-9. External quality assessment program from quality control for molecular diagnostics. Available from: http://www.qnostics.com/molecular‑controls/. [Last accessed on 20.08.15]. Sircar M, Ranjan P, Gupta R, Jha OK, Gupta A, Kaur R et al. Impact of bronchoalveolar lavage multiplex polymerase chain reaction on microbiological yield and therapeutic decisions in severe pneumonia in intensive care unit. J Crit Care 2016;31:227-32. Mathew JL, Singhi S, Ray P, Hagel E, Saghafian-Hedengren S, Bansal A et al. Etiology of community acquired pneumonia among children in India: Prospective, cohort study. J Glob Health 2015;5:050418. Ramalingam RT, Chakraborty D. Retrospective analysis of multiplex polymerase chain reaction-based molecular diagnostics (SES) in 70 patients with suspected central nervous system infections: A single-center study. Ann Indian Acad Neurol 2016;19:482-90. Jain S, Banavaliker J. Empyema thoracis: Bacteriological analysis of pleural fluid from the largest chest hospital in Delhi. IOSR J Dent Med Sci 2013;3:46-51. Mohanty S, Kapil A, Das BK. Bacteriology of parapneumonic pleural effusions in an Indian hospital. Trop Doct 2007;37:228-9. Menezes-Martins LF, Menezes-Martins JJ, Michaelsen VS, Aguiar BB, Ermel T, Machado DC. Diagnosis of parapneumonic pleural effusion by polymerase chain reaction in children. J Pediatr Surg 2005;40:1106-10. Insa R, Marín M, Martín A, Martín-Rabadán P, Alcalá L, Cercenado E et al. Systematic use of universal 16S rRNA gene polymerase chain reaction (PCR) and sequencing for processing pleural effusions improves conventional culture techniques. Medicine (Baltimore) 2012;91:103-10. Jerng JS, Hsueh PR, Teng LJ, Lee LN, Yang PC, Luh KT. Empyema thoracis and lung abscess caused by viridans streptococci. Am J Respir Crit Care Med 1997;156:1508-14. Dass R, Deka NM, Barman H, Duwarah SG, Khyriem AB, Saikia MK et al. Empyema thoracis: Analysis of 150 cases from a tertiary care centre in North East India. Indian J Pediatr 2011;78:1371-7. Baradkar VP, Mathur M, Kulkarni SD, Kumar S. Thoracic empyema due to Candida albicans. Indian J Pathol Microbiol 2008;51:286-8. Ko SC, Chen KY, Hsueh PR, Luh KT, Yang PC. Fungal empyema thoracis: An emerging clinical entity. Chest 2000;117; 1672-8. Jiménez D, Díaz G, García-Rull S, Vidal R, Sueiro A, Light RW. Routine use of pleural fluid cultures. Are they indicated? Limited yield, minimal impact on treatment decisions. Respir Med 2006;100:2048-52.